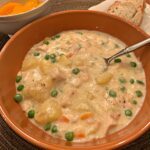 This tasty Chicken Pot Pie Soup is simple to make and doesn’t require the use of any canned soups! Hearty, rich, and comfort food at its finest! 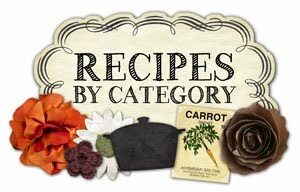 This new year, my mom has been trying all sorts of new recipes for my dad and her. Anytime she and my dad deem it a winner, she passes the recipe my way for me to share! Last week, my mom told me she was making a chicken pot pie soup for their dinner. She had bought all the ingredients including crusty bread to serve with it! Just after dinnertime, my phone beeped with several texts and sure enough, she had sent over these pictures along with the recipe. My dad had said it was in his top three of favorite soups EVER. Impressive, right?! My mom said it was creamy, rich, and hearty. It was just like enjoying a chicken pot pie, only in soup form! 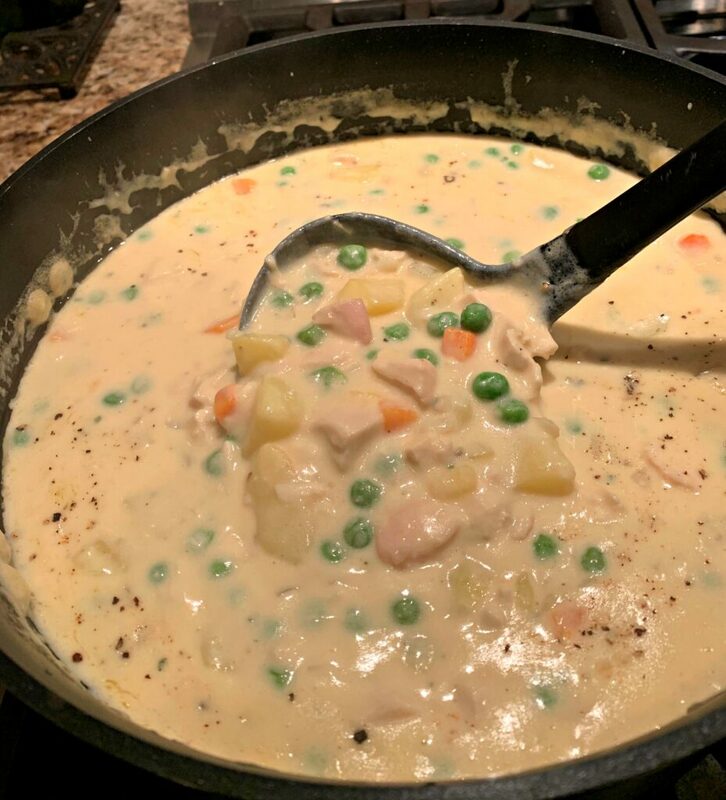 With the veggies, potatoes, and chicken….it was a complete meal in one pot! She had plenty of leftovers to send my dad to work the next day with lunch, as well as send a container my way to test out for myself! Since I had the fun role of playing taste tester (I am usually the cook, so this was great), I definitely say this soup is a must try! You can even cook up a pie crust and cut into small pieces to serve as a side or additional topping with this! Whether you enjoy the soup as is, serve with crusty bread, a side salad, or with pieces of pie crust….you’ll definitely enjoy it! The perfect “comfort food dish” to serve for having company over, and it freezes perfectly! 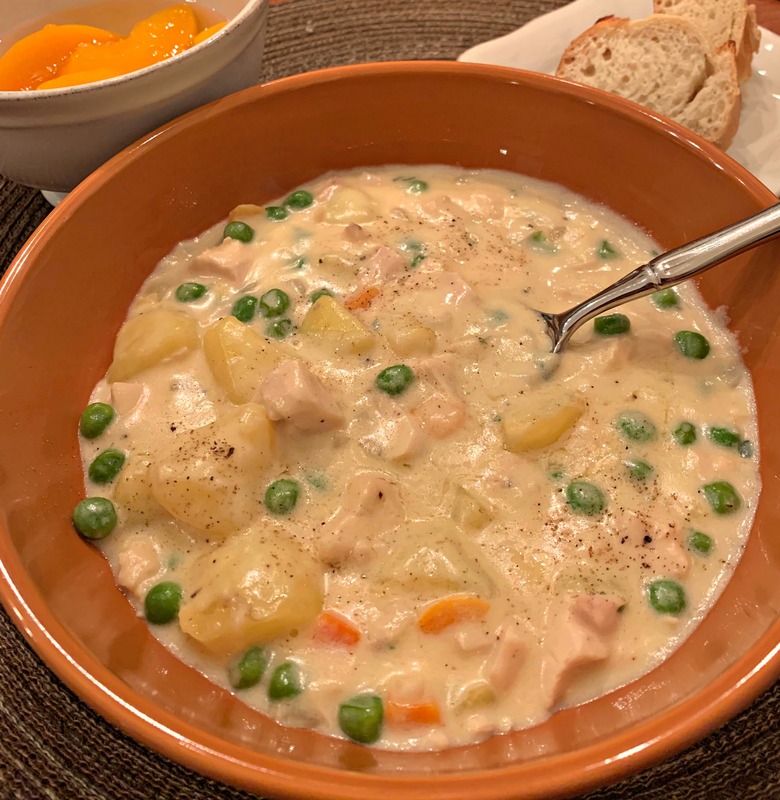 This tasty Chicken Pot Pie Soup is simple to make and doesn't require the use of any canned soups! Hearty, rich, and comfort food at its finest! In Dutch oven, sauté onion and garlic in butter for about 2-4 minutes, or until tender. Sprinkle flour over the onion and stir to create a roux. Add in the chicken base, chicken broth, bouillon cubes (if using), and heavy cream. Stir until combined. Add in the chicken, potatoes, nutmeg, pepper, salt, and peas/carrots, stirring to combine. Lightly simmer for about 10-15 minutes, stirring regularly. Sprinkle with Parsley if desired and serve warm. *I cooked potatoes separately from soup until tender, tossing them in at the end. If you prefer to cook together, add additional cook time. Wow wow wow. Great soup recipe. My husband loved it as well as an elderly couple that I shared a quart jar with. Only change I made was I used 2 C. Heavy cream & 2 C. Milk so not so thick. Also added a little extra water when reheated for eating the next day. 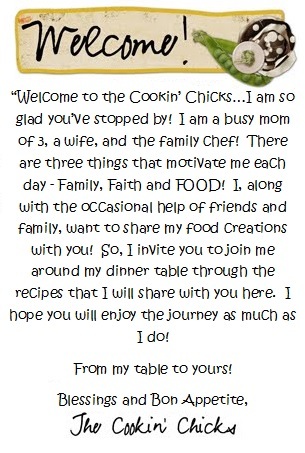 Fabulous recipe & thanks for sharing. Yea!! So glad you enjoyed it!! !